In June 2010, the church of Saint Paul the Apostle in Westerville, Ohio, celebrated the dedication of its new building. 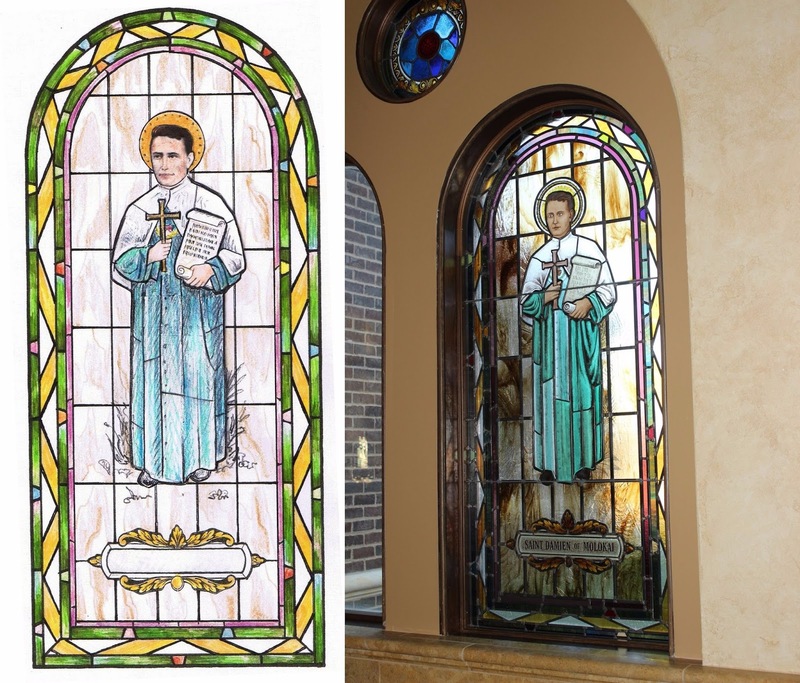 About a year earlier, the artists and craftsmen of Cleveland-based Henningers Inc started work on what would eventually be 164 new and refurbished stained glass windows for the new building. Now, years later, the last of these windows are finally being installed, the end of a long and complicated process. In 2009, the parish was about to begin construction of a new church, the third building in its history, and the largest Catholic Church in Ohio. As the building project itself was such a large one, there were no immediate plans for stained glass; that would come later, or so it was thought. The Diocese of Cleveland, however, had just undergone a significant downsizing and consolidated many of its parishes, leaving many buildings empty, and a great many stained glass windows in crates. The opportunity to re-use these discarded windows was one which could not be passed up. 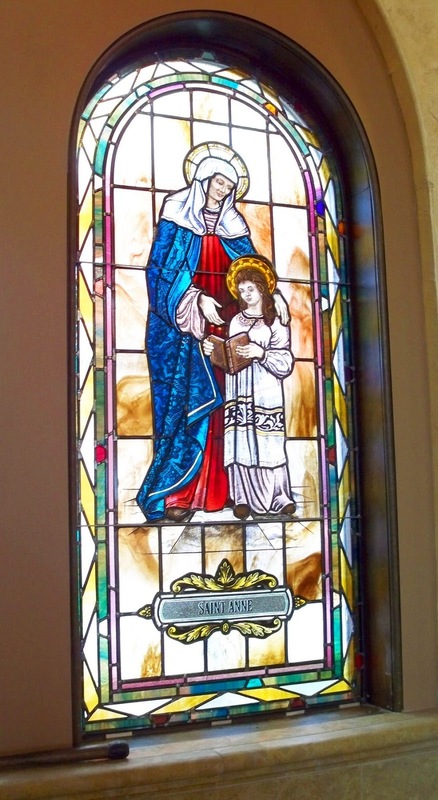 Saint Paul purchased stained glass windows, all between 70 to 100 years old, from three separate closed churches. One set had incredibly colorful geometric patterns and dozens of medallions of saints and religious symbols, another group had large narrative scenes of the New and Old Testament, with ornate painted scrollwork borders. The third set had large round windows with scenes from the life of Christ. All of the windows were beautiful in their own way, but markedly different in style; the challenge would be to synthesize the windows into a cohesive overall scheme. every new window in the church. The elaborately painted scrollwork from the narrative windows was duplicated and repeated in nameplates and decorative flourishes throughout the church, while stenciled rosettes were copied and incorporated in newly created windows over the front doors. A new background grid pattern of brown and clear swirled glass would provide a unifying framework for the various scenes and saints and symbols. Every window in the church was designed to fit in the new openings with mixed stylistic elements that could harmoniously sit together. 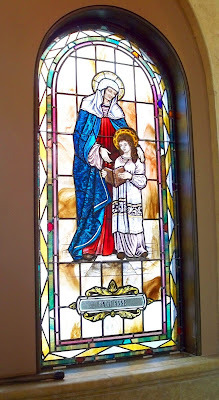 Given that the windows were so old, they all benefited from being taken apart, cleaned, and rebuilt with new lead, a typical procedure with older, time-worn stained glass panels. Once apart, they could be re-arranged to the new specifications. Some parts, like the geometric knot patterns and the painted scenes were rebuilt exactly as they had been. Other decorative painted pieces were too good not to re-purpose and incorporate wherever possible. New glass borders and backgrounds were cut to frame the painted scenes and medallions. There were dozens of windows to re-arrange and fit into the new church’s design scheme, but one could hardly expect the found treasures to meet all of the needs of the new church. There were Saints and symbols that would need to be made from scratch to match the old glass. In the end, two dozen new medallions were painted to complete the clerestory, confessionals, and shrines. 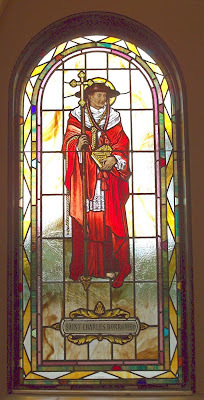 A series of 40 new standing-figure Saint windows were created to line the ambulatory around the perimeter of the church. Working with the parish and the donors to design the medallions and Saint windows was an incredible learning process, which gave us the opportunity to research lesser known Saints and learn more about the ones we thought we knew. Preparatory work for a window of St Damian of Molokai, and the final product. Perhaps the most satisfying design challenge of the whole project was the 12 foot rose window, with a crucifixion scene surrounded by twelve petals. The image of Christ on the cross with adoring angels was originally a tall thin lancet in three panels. Here, new glass was added to expand the sky and clouds and make a round center for the rose. The twelve petals around it, while mostly new, incorporate old glass and design motifs from all of the churches from which the old stained glass had been purchased. This kaleidoscope of glass is a new creation made from the old, so that the grandest window of this new church pays homage to the old churches that made this project possible. Over the course of the years, it has been satisfying to see Saint Paul the Apostle Church slowly filled with stained glass. Bit by bit, window by window, patron by patron, the place has been transformed. It will be satisfying to install the last of the remaining windows, but the biggest change came last December when the final windows in the sanctuary itself were installed. The natural light in the church was forever changed. The outside world was obscured, and the sacred space inside felt different, becoming quieter and more serene. 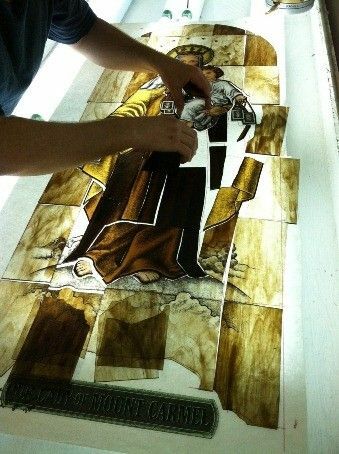 Old stained glass windows that had watched over worshippers for 100 years were once again doing their work.